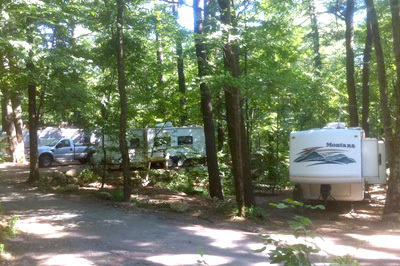 At The Pines Campground, we know that some people prefer a little more luxury in their holiday getaways. 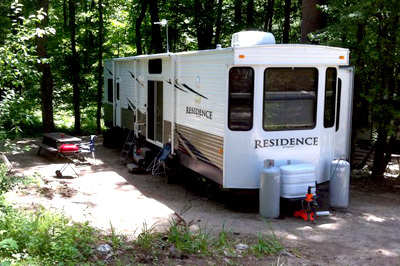 Bring the comforts of home with you while still enjoying the great outdoors at one of our RV camping sites! Offering water and electric hook-ups, our rustic sites will bring just the right amount of enjoyable rest and relaxation to your RV camping holiday. All of our sites are wooded and every site is treed, offering you an increased level of peaceful tranquility as you get back to nature, your way! 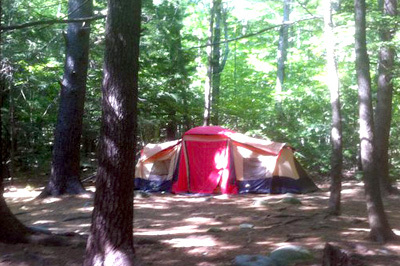 Get back to nature and enjoy a simpler way of life in one of our many tent camping sites. All sites are large and private, and every site is treed. Relax and rest up in quiet and peaceful natural tranquility, and enjoy the way things could have been in a simpler time with our basic tent sites. If you prefer to keep a few more modern elements in your camping vacation experience, we also offer tenting sites with both water and electricity. Getting back to nature doesn’t mean you have to get dirty. We offer bathrooms with running water, and hot showers for our guests, too. Go for a hike, take a dip in the pool and know that you can spend your day in the sun feeling clean and refreshed. A fee will be charged for early arrivals and late departures. Total payment due in advance on all weekend and monthly rates. Rates based on a family of 5, (includes 2 adults & 3 children under 16). ALL VISITORS must stop at the office to register and pay fee. All visitors must leave by 9:00PM. CAR PASSES are required on all visitor vehicles. If a staff member has to go to site to collect visitors fee, the charge is DOUBLED! Cable available for additional fee. Please inquiry at the office for details. Children 16 & under cannot be left unattended overnight. Deposits are required for all sites. Refunds will be honored at 10 days advanced notice. Full site fee payments are due on all holiday weekends. On holiday weekends, a refund will be honored at a 20 day advance notice.